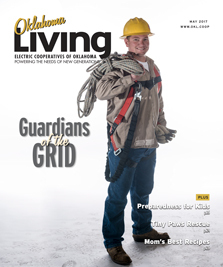 Oklahoma Living has the largest statewide circulation of any monthly tabloid published in Oklahoma. It goes into more than 325,000 homes, offices and businesses, with 98 percent of this circulation in Oklahoma. Four-color ads are available on request. Inserts are accepted, rates quoted on sample copies. For more information, visit www.okl.coop.